CAMPAIGNERS stepped up their fight against a proposed new road across the Eastern Bypass yesterday as they delivered a petition to the Town Hall. Northway Residents’ Group and backers in Marston and Headington have collected 1,800 signatures against Oxford City Council plans to link Northway with the proposed Barton West development by building a new link road for buses and emergency services across the A40. People on the estate say the new road will destroy green space used by residents for six years. New maps for the proposed development now show for the first time that buses will also be able to drive off the ring road and into the Northway estate. Residents’ group secretary Sheila Hessey, pictured second left, 76, said: “Of all the times I knocked on people’s doors asking for their signature, just one or two per cent refused. 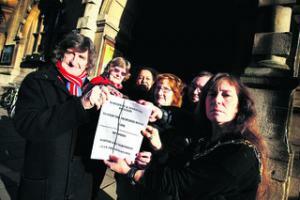 The size of the petition will now trigger a debate at the Town Hall about the plans. In the New Year, residents hope to apply for ‘town green’ status for the 4.5-acre strip of land along Foxwell Drive, protecting it from development. Also pictured, left to right, Mick Haines, Georgina Gibbs, Jane Cox, Nick Fell and Lord of Oxford Mayor Elise Benjamin. From, left to right, Mick Haines, Sheila Hessey, Georgina Gibbs, Jane Cox, Nick Fell and Lord of Oxford Mayor Elise Benjamin. LEGAL wrangles look set to keep an Oxford play area in the dark again this winter. Campaigners have been trying to get extra lighting at Croft Road recreation park in Marston since 2007, so that children can use play equipment during autumn and winter months. Two years ago, Oxfordshire County Council promised the lights in a £180,000 scheme to upgrade the park’s cycle path. It would have lit the path by Rippington Drive, down Croft Road and along Purcell Road, and the lights would have been angled so the play area could be used in the evenings. But when some residents complained the lights would be too close to their homes, questions were raised over the legal ownership of land behind Purcell Drive. Roy Darke, county councillor for Headington and Marston, said the two year delay in settling the dispute and lighting up the area was a “disgrace”. 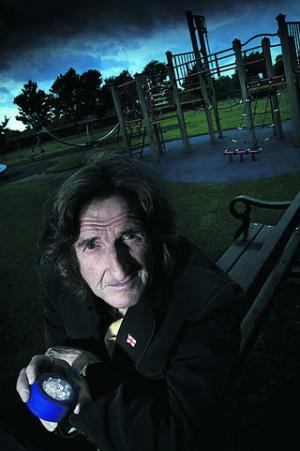 The lighting scheme has been fought for by community campaigner Mick Haines for four years. He even took a petition of 1,205 signatures to 10 Downing Street in September last year. The retired scaffolder, who lives in Croft Road, said: “It is crucial we get these lights as we are going into another winter. He added: “It’s been a long drawn out job. Mr Darke said of the delay: “It has gone on and on and on. “Mick Haines is quite right and in some ways it is a bit of a disgrace. He said the question of ownership should be sorted out in “the next month or so” adding: “I believe we are on the last lap. He warned the lights could not be installed before the path was upgraded. He added: “The county council is very reluctant to do a job in two bits. It is 100 per cent regrettable and the footpath is a disgrace, but there have been these legal obstacles that have taken time to resolve. I AM pleased to see Councillor Roy Darke has now seen the light (Oxford Mail, viewpoints, October 11) and at least realises the importance of installing lights at Croft Road Recreation Ground. It seems like a never-ending battle to get them! First of all the original cost was as follows: £28,000 for the lights; £5,000 for the electricity supply; circa £600 per annum to maintain them. But now with the additional wider scheme introduced by the councillors with two new bridges, one at Rippingdon Drive end, the other leading out of the park along the back of Purcell Road, the additional cost for lights there and the widening of the cycle track, the cost will be around £180,000. We were promised our lights in 2009, as quoted in the Oxford Mail by Councillor Darke. But it did not happen! The next year, I even went to Downing Street with a petition of 2,010 signatures. Still we are waiting for these lights to light up the park in these dark mornings and evenings to make it safer for all who want to use it. I have been told the work could be started in April 2012. Could it be a coincidence that there is a city election in Oxford next year, on May 4? Is this another winter of discontent without our lights? This week, Marston stalwart Mick Haines gives his take on life and what keeps him fighting. *WHAT I DO? I have been an independent candidate for Marston and Old Marston. I have stood about three times in city council elections and twice in county elections. I also do a lot of petitions, for example, about phone masts and the subway in Headington. I have been to Downing Street three times with them. *WHERE I LIVE? I have lived in Marston since 1973. I was brought up in Headington, where I lived with my grand-parents until I was four years old. I love Marston, it is a beautiful area. It is one of the best areas in Oxford and there is a good community spirit here. *WHO I LOVE? I love all my family. There’s my wife Janice and I have got six children, eight grandchildren and two great grandchildren. I get a bit frightened at birthdays because there are so many of them. I’ve got one great grandchild on the way. I feel proud to be a great grand- father. It doesn’t make me feel old, it keeps me young. *HAPPIEST YEAR? Probably I would say the end of the 1950s because of rock and roll. I would have been around 18 at the time. I used to go out in a car or motorbike and have a good time. There were a lot more local pubs in Oxford at that time. *DARKEST MOMENT? When my adopted parent died. I lived with them after living with my grandparents. They brought me up well. They did a good job with me and I stayed out of trouble. My adopted father died in 1962 and in 1992 my mother died. *PROUDEST BOAST? That I managed to own my own firm. I was very proud of my work as a scaffolder and I probably employed about 28 people in all. *WORST WEAKNESS? My weakness is probably that I don’t like people who smoke. I don’t smoke myself and I never have in my life. I saw other people coughing and it put me off it completely. My mother used to smoke and I thought I didn’t want any of that. *LESSONS LEARNT? Live for the day and fight all the way for what you believe in. I have fought a few battles myself, such as with the subway in Headington. I would probably say that if you want to go for something you have got to fight for it and not give in. *DULLEST JOB? It was probably when I was a painter aged 18. There were four of us in this big room and no one spoke all day. At the end of the day I picked up the brush and just ran it around the skirting board. The next day my boss moved me with the bricklayers. *GREATEST SHAME? Probably when I lost the battle for the subway in Headington. I was so sure we would win that one. We heard they were going to fill in the subway and I spend a year picking up signatures. In all I picked up 5,447. I felt I let down the people who wanted it kept. *LIFELONG HERO? The person I used to look up to was Elvis Presley. I think he was the most brilliant musician ever and I listen to his music all the time. He came from a poor family and to come through life as he did is great. *OLDEST FRIEND? I would probably say Johnny Prescott. I have known him since 1962. I met him when we were riding our motorbikes. *WIDEST SMILE? What made me happy was when I picked up my Advanced Scaffolding Card because it proved the work I was doing through the years was good. I got it in 1979 and it means that you are a top scaffolder and can work on the big jobs. *FAVOURITE DREAM? To live as long as I can and for us to have a good world carried on for the younger people. *BIGGEST REGRET? It is probably what has happened to Oxford since I remember it from when I was young. For a start I regret the number of pubs that are not there now. The excitement is not there now. THERE’S a new form of road rage in Marston. It’s not the motorists who are at their wits’ end but residents worried the area’s chronic congestion will get worse if the 1,000 home Barton West housing development goes ahead. Community campaigner and Marston resident Mick Haines has launched a petition – backed by nearly 500 signatures – demanding action to prevent the area becoming even more gridlocked. He said current traffic levels and parking by non-residents would be exacerbated by traffic from the proposed estate. But Oxfordshire County Council has said it is working on the traffic issue and has urged more people to use public transport to combat the problem. Mr Haines said: “At the moment we have got so many cars in Marston that it is gridlocked. The people here don’t want any more cars. Barton West will increase the number of cars coming through Marston. If they are building new houses they need a new road structure. “Marsh Lane cannot take any more cars and there are terrible parking problems on Oxford Road. Barton West will see about 1,000 homes built on land which is owned by Oxford City Council, with one junction linking it to the ring road. A spokesman for Oxfordshire County Council said: “The council is aware of the concerns. “We have already put traffic calming measures in Old Marston and there are several access only signs in place. In the wider area, we are encouraging people to use other means of transport. Roger Baycock, who runs saxophone shop Allegro Oxford on Marston Road, agreed there was a traffic problem. He said: “It is extremely bottlenecked and would stop any fire engines and ambulances. Mr Baycock added that on a number of occasions the junction with Old Marston Road outside his shop has been completely blocked with traffic. Marston city councillor Mary Clarkson said: “Traffic through Marston is in certain parts problematic, particularly in Marsh Lane and in Old Marston village. This has been a long standing problem. I am working with the county council to see about increasing the amount of residents’ parking. 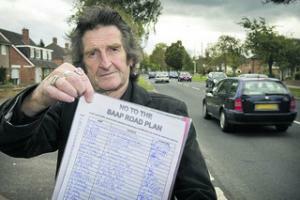 Mick Haines in Marston Lane with his petition against any increase in traffic in the area.